In recent years, Twitter has made a lot of changes and come under a lot of fire in the media. 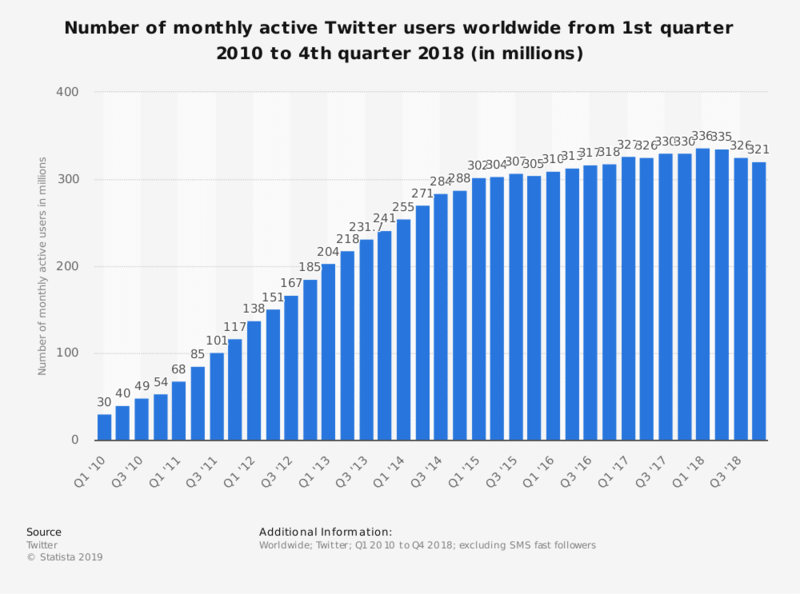 You might imagine that all the action could mean that Twitter marketing as a viable solution is on its way out, but the reality is far more optimistic than that. For years, Twitter has been one of the most widely used and innovative platforms on the Internet. With a current average of 6,000 tweets per second, it’s hard to imagine a day when Twitter would cease to be a valuable communication tool. And if you’ve been following the news at all for the last decade, chances are you’ve become familiar with Twitter. The platform dominated headlines in 2009 when an American Airlines flight crashed into the Hudson River because it broke the news before traditional media. But does Twitter work as a marketing tool for your business? And if it does work, what steps can you take to capitalize on this unique platform? Before you dive in though, you have to understand the current landscape of Twitter. 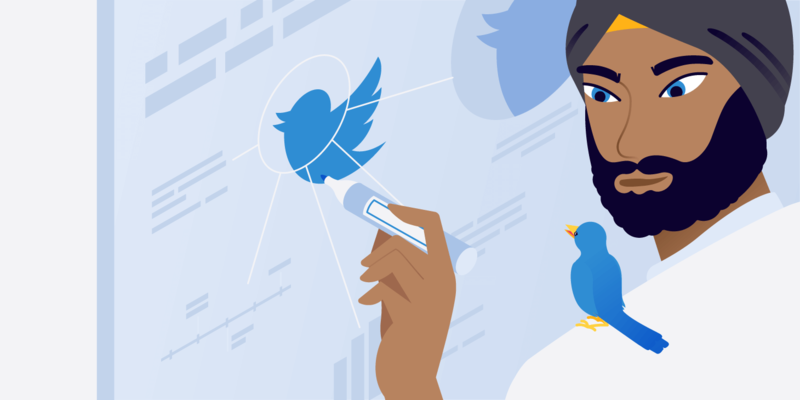 So to kick things off, let’s look into some of the current Twitter trends and how they affect your ability to market your brand on the platform. At first glance, the prospect of using Twitter for marketing doesn’t look so good. In 2018, the platform’s growth actually declined from a peak of around 336 million monthly active users down to 321 million. For a social media platform, this is not great performance, especially when compared to others like Facebook and Instagram who are growing at a rapid pace. So one of the bigger points that many brands have against a serious Twitter marketing strategy is simply its relative smallness. Even though 42% use uses are on daily, why use Twitter when you could potentially reach an additional two billion active users on Facebook? The key to remember is that looking at growth and user population only paints half the picture. You may have a smaller pool of users than Facebook, YouTube, or LinkedIn, but the flip side is that you can realize much greater levels of brand interaction via Twitter. Or to put it another way, the conversations you create are the true metric that proves the value of Twitter. More than any other social media site, Twitter users engage with the brands they follow. More than three-fourths of Twitter users have interacted with a business, and an impressive 83% feel a greater affinity with a brand they’ve interacted with. That means if you can create a presence that fosters conversation with your followers, they’ll be more willing to hear what you have to say in the future. Another element of Twitter that works in your favor is how often its users find and interact with a new small- or medium-sized business (also known as SMBs). According to research compiled and published by Twitter, 66.4% of users say they’ve discovered a new brand through the platform. So users are wanting to engage with your brand, and they’re actively looking for new businesses to engage with. You’re not just fishing within your existing audience on Twitter because there’s the constant possibility that your followers will grow with each passing day. But the biggest upside of Twitter isn’t engagement. It’s how willing active followers are to buy from a brand. According to that same study, 93.3% of users who follow a small business on Twitter are planning to make a purchase, and 68.75% have already bought something. So not only are you engaging more, you’re selling more. You can be much more upfront about your goods or services than any other social platform without turning users away. The ultimate value of Twitter is dependant on your brand, but it’s hard to ignore numbers like the ones you’ve been looking at. Using Twitter as a platform for social engagement and growing your business can be a wise choice if you implement the basics and post regularly. 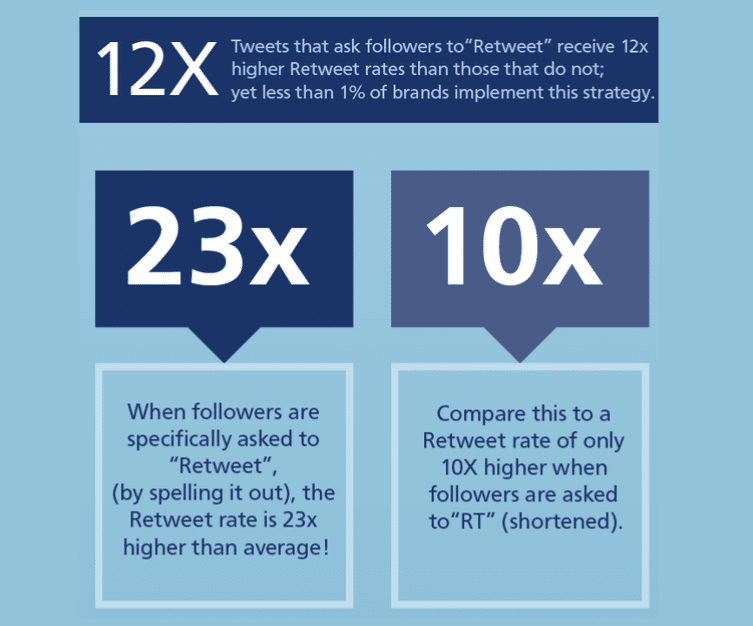 To help you launch your own Twitter marketing strategy, let’s start by covering the basics. Then, you can dive deeper into some more proven strategies at the end of this post. For years, Twitter relied on a feed that showed every tweet or retreat in reverse chronological order. Nothing was filtered or curated at all. But in recent years, Twitter has gone the way of AI and algorithms to give its users a better overall experience. While they might have a better time browsing, it’s presented some problems for brands that used to be guaranteed impressions and engagement simply by posting at the right time. To combat this downtrend, Twitter themselves have published a guide on the basics of creating good content. To help you understand why these tips work, we’re going to take them a step further and show you data from studies and brands that have succeeded by following this guide. Since its creation in 2006, Twitter has limited its users to a mere 140 characters. Over the years, this has led to some rather creative abbreviations, short-winded rants, and even the creation of URL shorteners. But in 2017, Twitter did the unthinkable. They doubled their character count to 280. 😮 To some, this was like a long rain after a drought, while others were less than enthused. If you weren’t looking, the most interesting element of this change would have been easy to miss. Despite what you may imagine, users continued to rely on shorter forms of communication in their tweets. 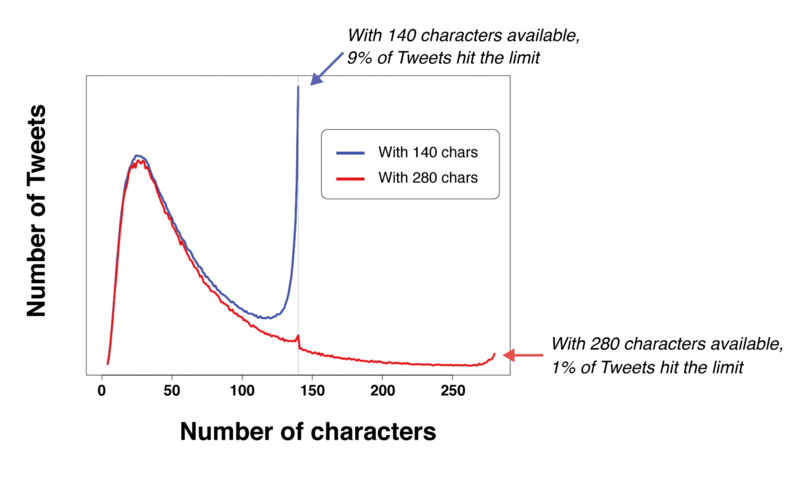 It could just be habit built over a decade of 140 characters, but in the months since changing the character limit, only 1% of tweets are using the full character allotment. The trend of keeping it short and sweet remains steady. It’s also worth noting that 280 characters still isn’t very much when you think about it. The paragraph preceding this one is only around 240 characters, so you’re still not getting more than a few sentences to convey your message. And while users tend to not cap out their 280 characters, it has been shown that lengthening your short messages can give you a greater amount of likes. But no matter how you swing this topic, Twitter is the social platform that values conciseness above all else. Even with the ability to lengthen your post, it’s much more likely that pithy one-liners with a unique slant will remain the go-to for Twitter. You may not be building a cyborg dragon like Elon Musk, but if it’s possible to condense your posts and be concise, you’ll find a place on Twitter. Creating a visual marketing strategy for any social media site can be helpful, and Twitter marketing is no different. Brands constantly use and abuse the visual nature of Twitter’s news feed to help them engage with their audience. But let’s not get too far ahead of ourselves. 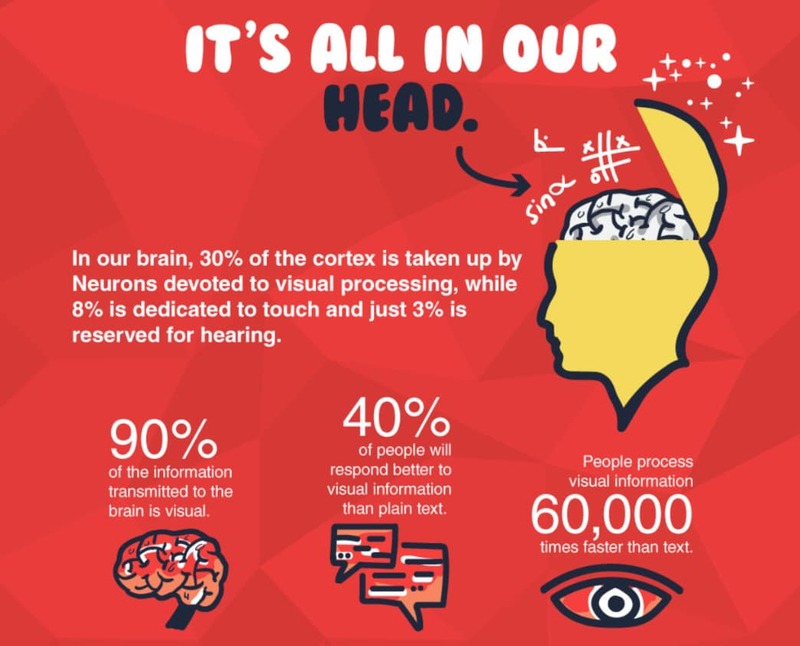 Looking at how and why visuals help your social media is always a good idea. To start with, you have to dig a bit into how the human mind gathers and retains information. According to numerous studies, visual information is easier to consume and retain than its text-based counterpart. Most of the information you gather on a daily basis is visual, so your brain is wired to absorb it 60,000 times faster. That means using images in place of your 280 characters can be more interesting and lead to more engagement than relying on text along. 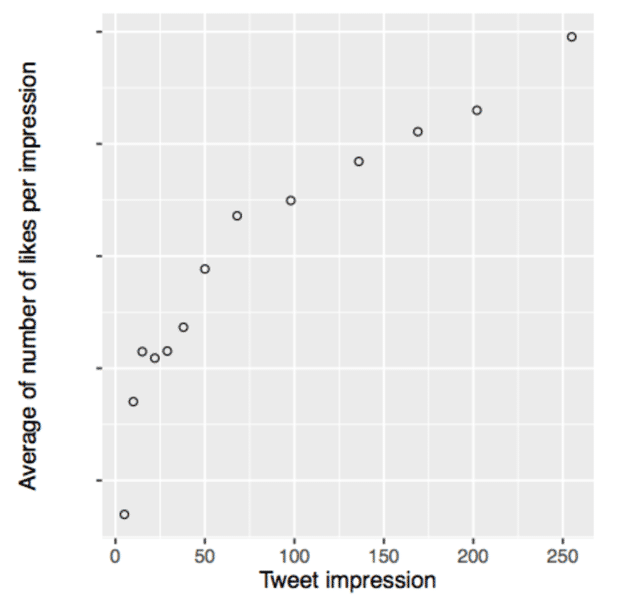 According to Twitter, tweets with images receive an average of 35% more retweets. But that’s just scratching the surface. 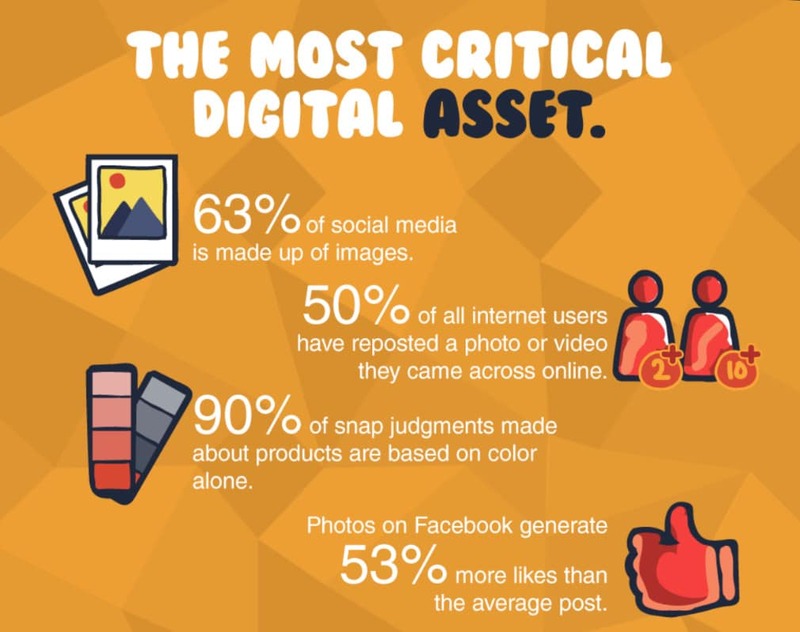 More than half of all social media is made up of visuals, and more than half of internet users are willing to repost images that they come across. So implementing visuals in your Twitter marketing isn’t just a good idea, it’s necessary. It’s one of the few ways that you can launch yourself outside of the 280 character limit and say what your words can’t. Below is an example of how we implement this at Kinsta. 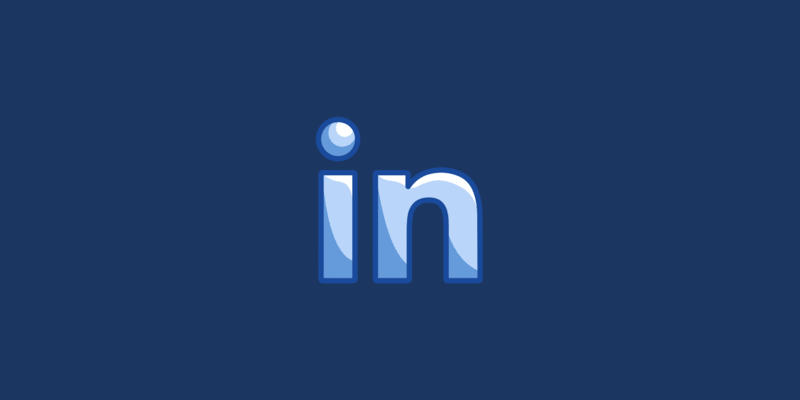 We want every Tweet’s visual to stand out and design all of our featured images with social media in mind! Make sure you configure Twitter cards on your WordPress site. We recommend going with the large image format. Or here is another example from a happy Kinsta client. They are using a visual graph that they know will catch people’s attention. Using a funny animated GIF never hurts either. The natural progression of #contentmarketing over four years. This is visual storytelling at its finest. Implementing your own visuals as part of a larger Twitter marketing strategy can help you engage with your followers and increase the likelihood of making a sale in the future. It’s just another way that Twitter can help you stand out from the crowd. Chris Messina originally proposed that the # symbol be used to help designate groups on Twitter. By indicating which group should read the message using the pound sign, users could track conversations and find like-minded users to interact with. Even though it was rejected at first, the idea eventually came around. But what do these hashtags do? The short answer is that when you add a hashtag to a post, Twitter indexes it and allows it to become searchable. 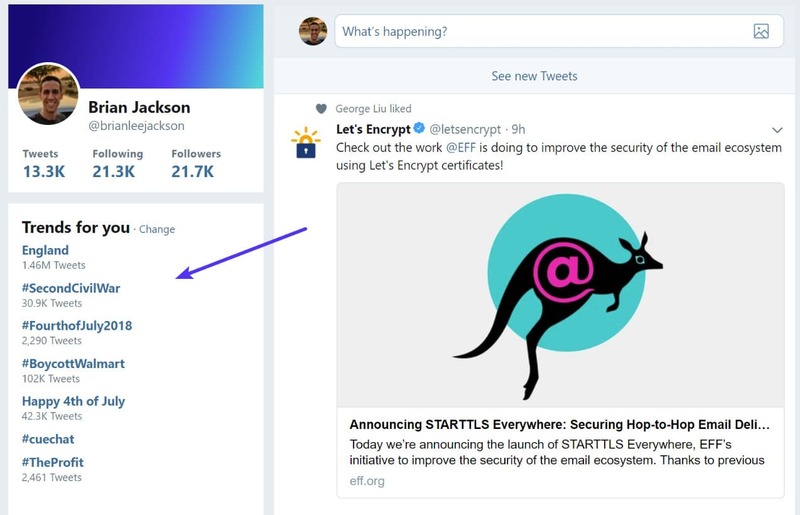 When someone clicks on or searches for a specific hashtag, they’re brought to a results page that displays all of the relevant posts in real-time. So a hashtag can go from nonexistent to extremely popular and then back in just a matter of a few days. 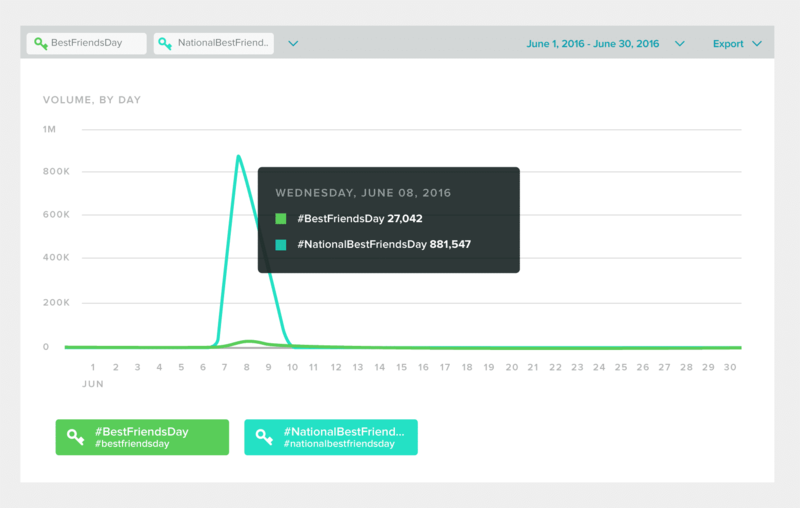 That creates both a problem and an opportunity for a brand that can leverage hashtags correctly. But taking advantage of seasonal or trending hashtags is just one part of the greater picture. Many companies use branded hashtags that they created to great effect. It might take more time for one of these hashtags to catch on, but the increased engagement and brand awareness is worth it. 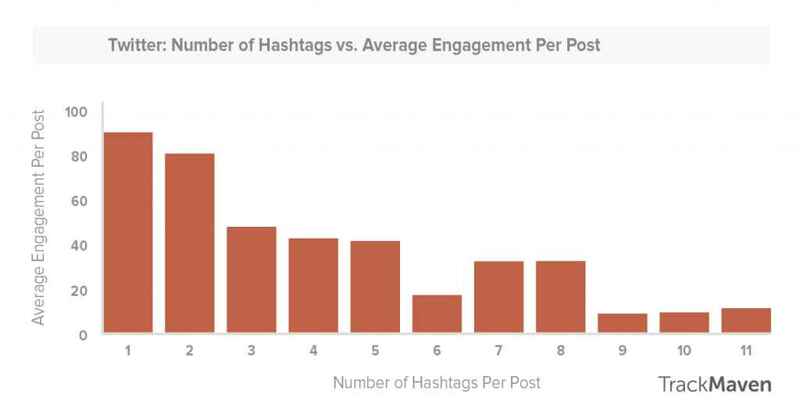 Tweets with hashtags get two times more engagement than those without. Just be careful you don’t use too many hashtags, as that can have a negative effect on your engagement as well. How you use hashtags is ultimately up to you, but there’s no denying that they’re an essential part of Twitter marketing. Whether you create your own or rely on trends, you can use them to find new followers and increase brand awareness. Twitter polls are one of the relatively newer features of Twitter, but that doesn’t detract from their popularity. 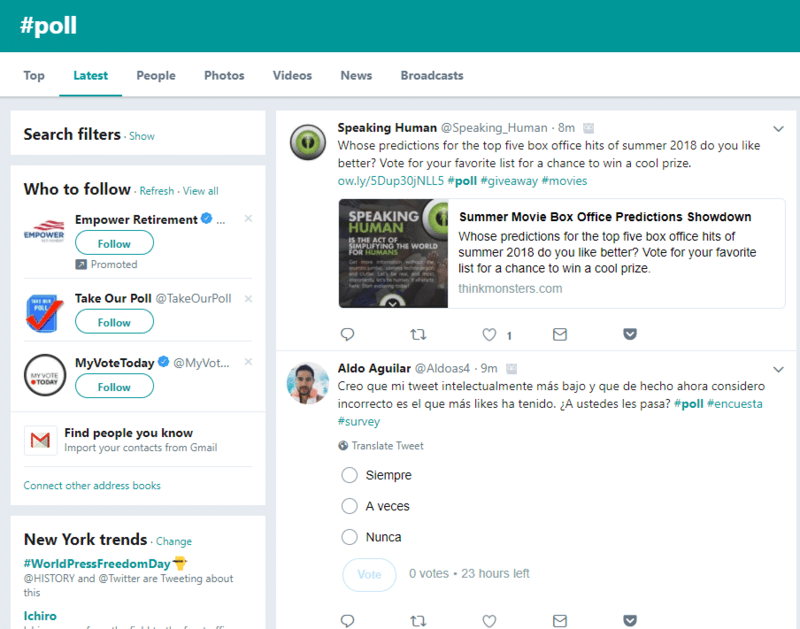 Just search #poll or #polls on Twitter, and you’ll find an exhaustive list of brands and users who are posting their questions for all to see. Using this feature as a brand can be a great way to get vital audience feedback and inform your content strategy in the long run. It can also be a great way to pose fun and interesting questions to your followers so that they see the lighter side of your business. For example, Search Engine Journal recently published a poll asking what their audience thought about their thoughts regarding the skillset a search engine optimization professional needed to have. Even if that’s French to you, it’s a question that’s catered to the interests and needs of their audience. It tells them that the majority of their users don’t value an SEO expert knowing a lot of details about paid search ads. They can now create and share content more accurately based on these findings. What’s also a great feature is that you can turn around and use this information to create graphics that are useful to your audience as well. There’s a good chance that many of SEJ’s followers included this graphic in their posts, which is good for everyone involved. Using a poll on your own Twitter account can give you similar results. You can be engaging and helpful with one simple task. The final basic that Twitter wants you to know about is the ability to retweet and reply directly on your feed. It’s one of the features that certainly helps make Twitter a unique jumble of overlapping conversations. While retweeting relevant content may sound like a lot of work, it’s one of the best ways to curate content on just about any social media platform. For example, the game developer Bungie frequently retweets content from their @BungieHelp account so that all of their followers stay up-to-date. This may sound like cheating, but it’s not. Using retweets is an everyday practice on Twitter. Even asking for a retweet has proven to be successful, as it has the potential to do wonders for your engagement. So even if it feels wrong, creating retweetable content should be one of your first priorities. Don’t be afraid to ask, because it will likely help more than hurt. And then spend some time trolling Twitter for shareable content that your audience will enjoy. Last but not least it to build Twitter ad campaigns which allow you to target audiences by hashtags, keywords, and even Twitter profiles. However, the very first thing you should do is get the Twitter tracking pixel on your WordPress site. This way you can start building an audience of people who have visited your website who you can retarget later. At this point, you’ve learned the basics that can help you be successful with your Twitter marketing efforts. But to create a unique, long-term, and successful Twitter marketing strategy, you will have to move beyond the basics eventually. To help you navigate those waters, let’s look at some best practices that successful brands have used to stand out from the crowd. We’ll share that we use at Kinsta as well! You can use one, all, or none of these strategies. Or, find your own method. Whatever you do, just remember that the basics will only get you so far. You’ll have to strike out on your own at some point, and these can give you the inspiration to do so. If you’ve been looking into Twitter for very long, you’ve probably seen brands like Wendy’s who seemingly kill it on Twitter by posting snarky comebacks and roasting other brands on a daily basis. While this tactic seems to work for them, they’re a rare example of this working for a brand. It’s easy to fall prey to survivorship bias and think that you can do this too, but you’re taking a risk that can easily backfire. 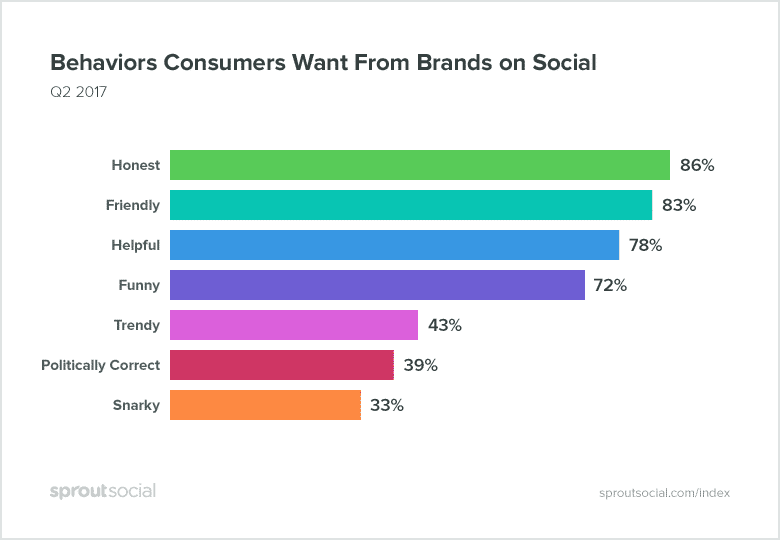 Instead, it’s recommended to find what consumers want from brands on social media. Rather interestingly, the tone of brands like Wendy’s are at the bottom of the barrel. By far, consumers want to see brands that are honest, friendly, and helpful. They want to know that your brand is willing to give direction and care about its users. It’s hard to do that if you’re constantly bashing your competition. 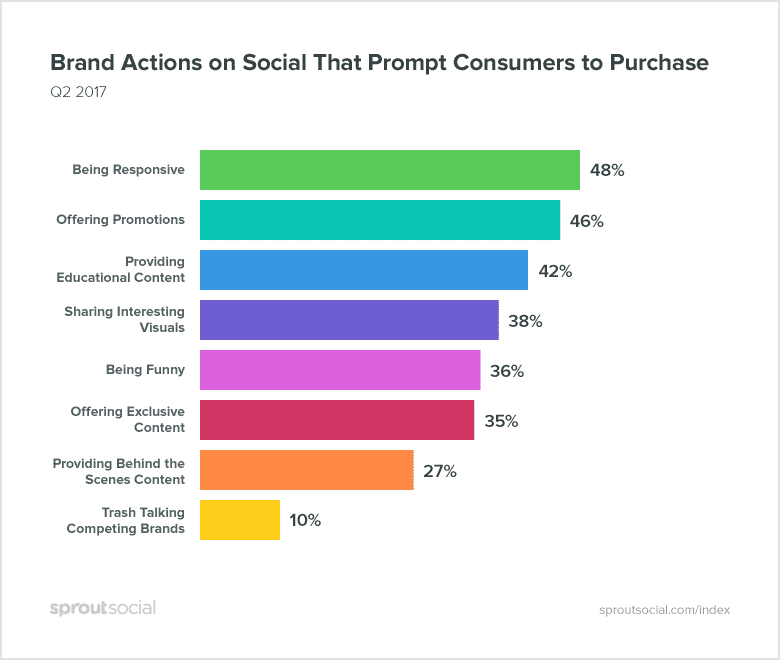 More insightfully, the same consumers that said they wanted honesty out of online brands said that they want them to be responsive as well. When you step back and look at the picture these trends create, you see a desire for conversational interaction. If you’re only ever posting content about yourself or your competition, you’re likely to turn people off. There are plenty of brands that have achieved this balance. Even within the fast food space, just look at how Taco Bell handles their interactions with their followers. Not only is their response funny and heartfelt, but the entire post is also relatable to millions of college students around the United States. It’s conversational and engages in a way that will make other followers want to interact with the brand. It may even prompt some to get a burrito that very day. The point is that mimicking other brands that you perceive as successful can be a mistake. Stick with a conversational approach, and then adapt as you see trends within your audience. 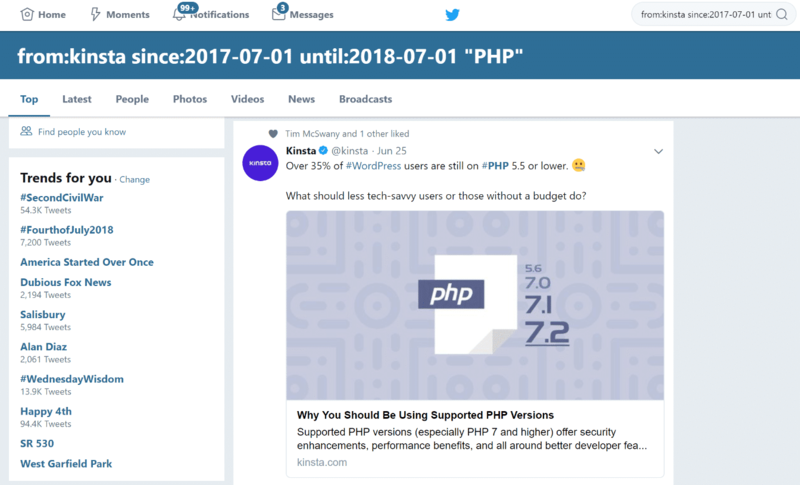 For example, we sometimes tweet out controversial posts about the state of PHP or HHVM in the WordPress industry. Sometimes these have a slightly negative connotation to them and stir up interesting conversations. The point is, we’ve found something that we know our audience will pay attention to, while still being honest and not starky. Here is another example of a controversial tweet that performed well. I strongly urge users to stop wasting time trying to increase scores on #pagespeedInsights by just a couple points. Yes, the tool offers advice. But spend time on your total load time and perceived performance. Eventually, you’ll have your own unique voice that will ensure your Twitter marketing stands out. If you’re new to digital marketing, influencer marketing is the practice of finding established figures or brands and then leveraging their connections in a way that helps you both. It’s a great way to create an audience for your brand where you previously lacked one. According to Sendible, Twitter is one of the best platforms for creating an influencer marketing campaign that will make an impact on your digital marketing as a whole. Start by creating a unique campaign that will benefit both you and your chosen influencer. Remember, an influencer could be simply a brand or product that you mentioned in your blog post. Brands love to retweet things that help promote themselves. By collaborating on a project, Oreo was able to leverage Shaq’s image as an appeal to a greater audience. You may not be able to work with a celebrity like this, but there are still plenty of influencers in your space. Create a project and reach out to them for help. You’ll eventually get a hit, and it will be worth the extra effort. 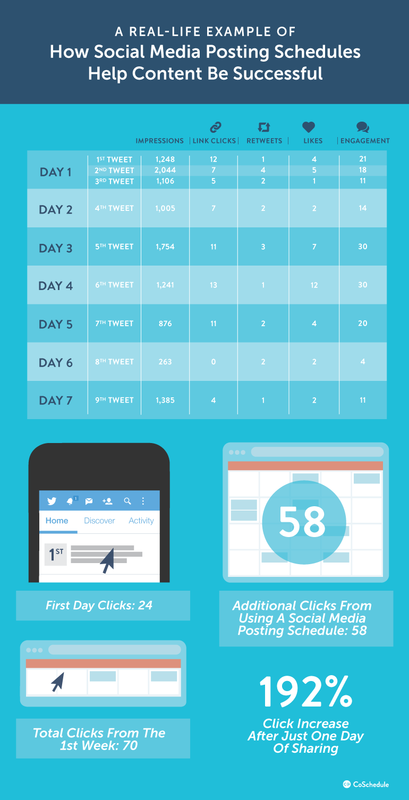 Last but not least, it’s a good idea to start creating a schedule for your Twitter posts. This can be beneficial for your engagement and help you save time in the long term when it comes to creating and scheduling posts. What you may have noticed in this image is that you’re posting multiple times per day. Even though this practice is usually shied away from on social media, the fast-paced nature of Twitter makes it a good idea. 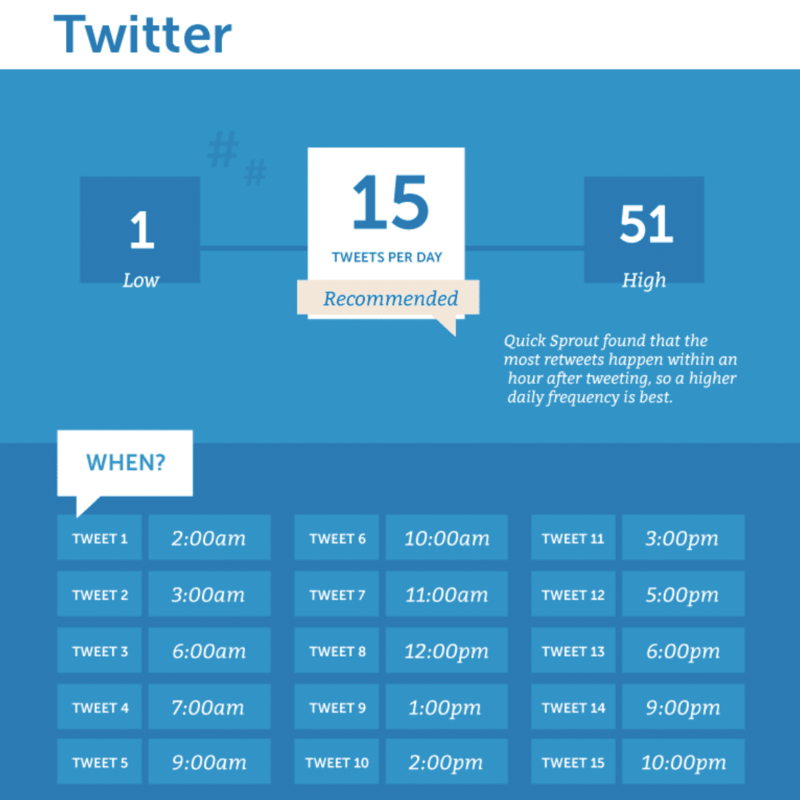 Remember you’re competing against 6,000 tweets per second, so tweet volume matters. These tweets should be spread out over the course of an entire month of course, but 15 posts in one day is still a lot of content. You’ll have to have a strategy that allows you to create enough content so that your messages don’t get stale. You can also look into scheduling services like Buffer, SmarterQueue, or HootSuite to help you automate your posting and not miss a beat. Chances are you won’t be awake at two in the morning to consistently post, so scheduling is the only option. Eventually, you can start running studies on your own Twitter marketing and find out what times work best for your brand. You can create the ultimate Twitter marketing strategy and keep building your digital presence for years to come. We are huge fans of Tweetdeck from Twitter and it’s completely free. Here are a few tips to take it to the next level. Get the Better TweetDeck Chrome extension to supercharge Tweetdeck with things like GIFs, emojis, muting, dark theme, etc. Create a notifications column. 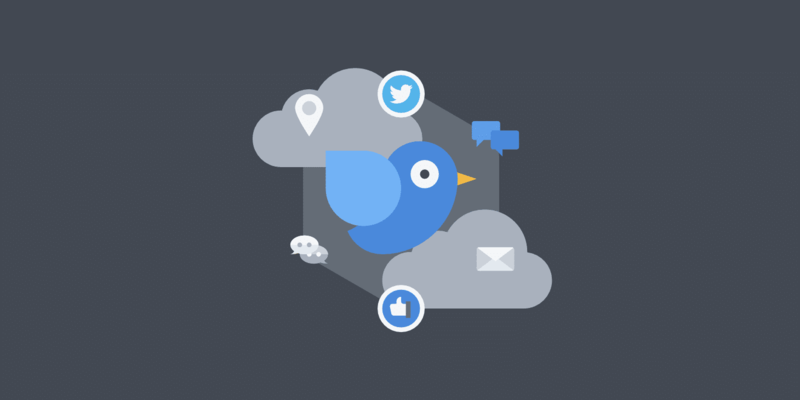 This will allow you to instantly respond to anyone that gives your brand an @ mention. Create a “search” column with your brand name. 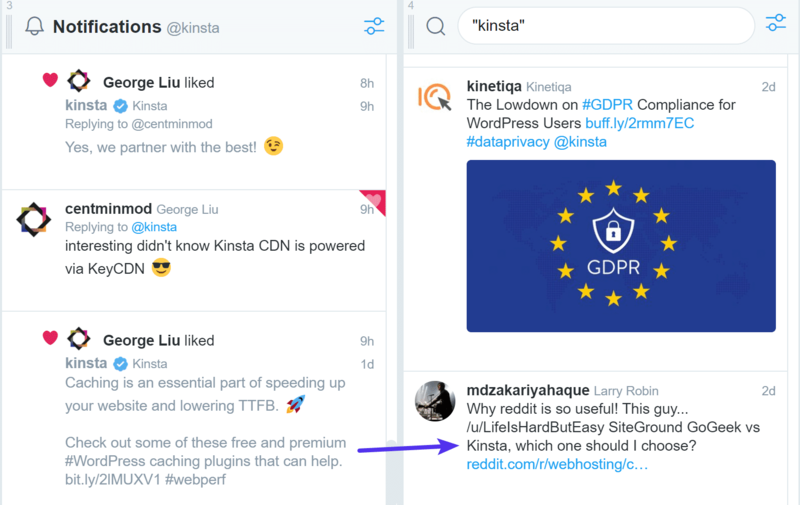 For example, we have a column with “kinsta” so that we can see any tweets that mention our brand name but perhaps don’t include an @ mention. You might be surprised by how many of these there actually are. Take it one step further and create a “search” column for your product or service. This allows you to see tweets for people that might not know about your brand yet but are in need of what you’re selling. And of course, make sure you have a “messages” column for followers that send you a DM. A couple other tools to check out include Mention (premium) and Warble Alerts (free). Tweets are gone in a matter of seconds. But sometimes you might need to find an old tweet. Perhaps you mentioned something to a potential customer and you need to recall what you said, or maybe you want to send out that tweet again. This actually happens to us quite regularly. Or you can use a free online site like TwimeMachine which archives old tweets. Note: this has a limit of 3,200 tweets. You might not be a fan of emojis, but they can help drastically increase your engagement. Internet marketer Larry Kim ran a quick experiment where he split-tested the same promoted post with and without emojis to the same group. Guess what? The emoji version has 25.4% higher engagement. Not only that, it was actually cheaper because Twitter rewards posts with higher engagement when using Twitter advertising. Even something as simple as a 👍 could make a big difference. Another great strategy we have seen to boost engagement is Twitter art. Basically, it’s a way to make text pictures with text symbols. This can be a clever way to help break through all the noise and stand out from the crowd. Check out a few examples of this below. What Version of #PHP Are You Running? Thanks to new privacy and transparency laws, Twitter now has what they call the Transparency Center. You can view all of your competitor’s Twitter ads for free! Simply search for the brand, company, or product that you are wanting to check out. In this example, we are using Adidas. Below, we can instantly see they are A/B testing different copy along with the same image. 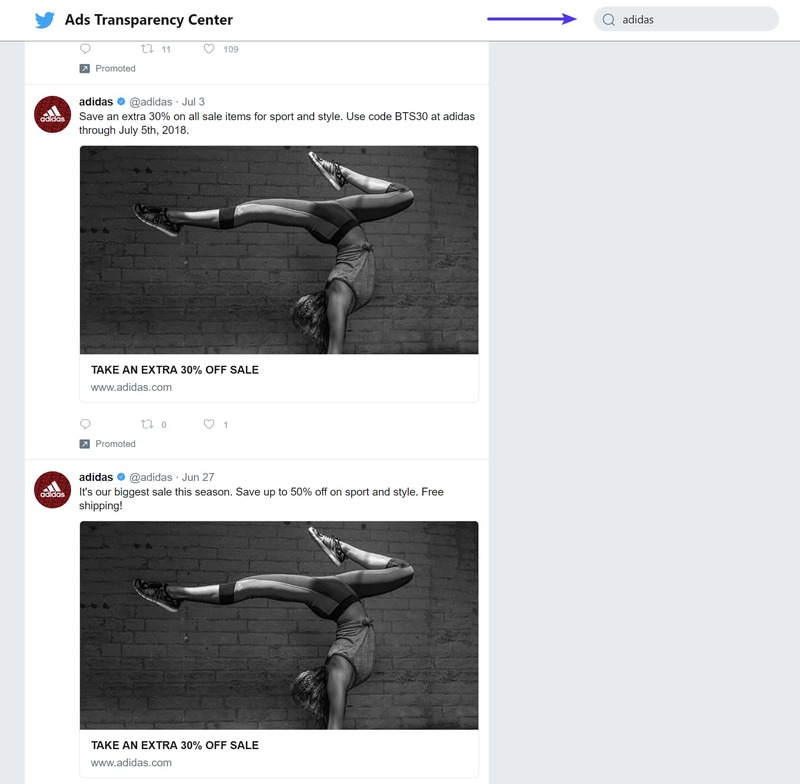 The Twitter Transparency can be a great way to get inspiration for your next marketing campaign and gain valuable insights from your competitors. Most important of all is to use Twitter to create connections with your customers. Don’t be afraid to use your own personal account to help leverage your brand’s presence. Sometimes connecting with customers is much easier when you start the process on a personal level. Our team has created so many great connections with people solely over Twitter we can’t even keep count! And in the long run, these connections lead to new customers. Twitter is a unique platform with plenty of opportunity for your brand. By understanding how to create and leverage content that interests your Twitter audience, you can create a social presence that helps you sell your product or service with ease. It’s best to become familiar with the basics before you jump in. Twitter values short content that still has personality, so it’s a good idea to include engaging visuals and relevant hashtags to perform well. You can also interact with followers by hosting polls or retweeting their content on your own feed. As you progress, you can start implementing more advanced strategies to help expand your growth opportunities. Striking the right balance between your unique voice and a conversational style is recommended. Or, reach out to an influencer whose voice can lend weight to your efforts. Finally, start researching to create a posting schedule that works for your brand. By posting frequently and at the proper time, you can create an omnipresent brand on Twitter that helps your digital marketing efforts grow. Even though Twitter is small, it’s the perfect platform for businesses that want to sell their brand. It may take time to gain traction, but once it starts working you’ll never look back.